Have a read about Larry Jordan's background, thoughts on plugins, and where he sees the industry heading, all in this exclusive interview with AV3. Enjoy! 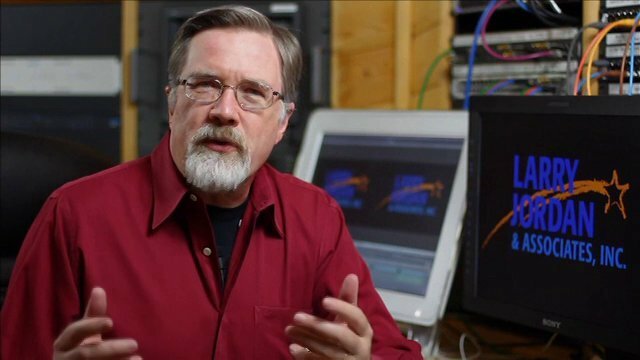 Larry Jordan is a renowned figure in the video editing industry with over 40 years of experience. He has worked as a producer, director, editor, consultant and trainer for both local and network television, and has also built an impressive portfolio of corporate videos and podcasts. AV3: What was your reason for getting into the editing game? Where did it all begin for you? Larry: It all began when I was fired from radio. I fell in love with radio and broadcasting in college, where I was deeply involved in our college radio station. I knew that my life would revolve around a microphone. My first job out of college was for a small radio station in northern Illinois - WRWC-FM - broadcasting “Beautiful Music” mostly to cows and pigs in the local farmland. That quickly my radio career shattered. Fortunately, the same day I was fired in radio I was hired as a camera operator at WHA-TV in Madison, Wisconsin. I went on to graduate school in Radio/TV/Film and spent the next 15 years working in broadcast TV as a producer/director. Oh! But you asked how I got into editing. Well, ah, after working in broadcast TV for a while, I decided - for reasons that are still totally murky - that I wanted to try something different. So I got into computer sales, software development and marketing, and event marketing. But , I missed TV and decided to get back into it. Except, now I was on the West Coast and all my credits, and contacts, were on the East Coast. I didn’t know anybody. And, in LA, people hire the people they know. Because of this, I couldn’t get a job in my first love - directing. Then, I tried to get hired as a producer. Nothing. An editor? Nope. After a lot of closed doors, I realized that if I couldn’t do, I would teach. So, 15 years ago, I started my current company specializing in teaching editing and technology. Out of that grew opportunities to produce, direct and edit. As with all “Getting Started” stories, mine was a straight path to success. AV3: You’re familiar with all the industry standard editing software out there, the Adobe Suite, Avid and Final Cut Pro just to name a few, are there any plugins for these that you consider essential for a video editor or VFX artist in 2015? Larry: There are so many plug-ins - and so many different types of editing - that there is no single plug-in that is essential for everyone. Music videos have an entirely different look than a religious broadcast. Feature films are different from commercials. What I love is the diversity, the vast number of options from simple utilities to tools that create magic. Clearly, established companies like Boris FX and Red Giant need to be considered by anyone looking to provide more than the basics that ship with an NLE. I’m really impressed with the diversity and growth displayed by the team at FX Factory. And newcomers like Rampant Design Tools, Motion VFX, NewBlueFX, and LightLeakLove can all provide unique looks for any project. And every editor should have a copy of Isotope RX4 on their system to clean up audio. AV3: Along the same lines of the previous question, which plugins do you find you use the most? AV3: Is there any plugins you haven’t tried but would like to? Probably hundreds. Because I spend more time writing about editing and providing training, I make a regular point to seek out new plug-ins to showcase. One of the roles I feel I can provide is to introduce new products and companies to my audience. I love spreading the word about something new. AV3: Is there some lesser-known plugins with great utility that you use and feel deserve more awareness, if so could you tell us a little about them? Larry: The utilities from Intelligent Assistance - 7toX and Producers Best Friend - are essential in our multi-platform, tight deadline environment. The folks at LightLeakLove and Rampant Design Tools are both creating excellent visual enhancement effects. The team at Arctic Whiteness has a killer utility in Final Cut Library Manager. And Pond5’s plug-in panel for Adobe Premiere Pr is amazing. AV3: With technology advancing at such a hard-to-keep-up pace for filmmakers and editors, where do you see video editing in 10 years’ time? Any predictions? Larry: Sigh… the future is not encouraging in the short term. Short-term, the pace of technological change is going to get quicker. Products will become obsolescent faster than ever. It will become increasingly hard for us to justify the purchase costs of new hardware because we won’t make our money back fast enough. Competition will increase, driving budgets down, which simply exacerbates these problems. The good news is that this downward spiral can’t continue - the industry can’t afford to support it. Software development will increasingly turn to a subscription/model to provide a consistent cashflow upon which to build a business. Hardware companies will look to provide upgrades to existing equipment to grow existing hardware without require throwing everything out for an upgrade. There will always be budget pressure, so the key to success requires mastery of your equipment and software, combined with solid creative skills and savvy marketing. It won’t be easy, but it won’t be impossible. AV3: You must be incredibly busy based purely on the content you put out. What does a typical day look like for you? Larry: (smile…) If it wasn’t for deadlines, I’d get nothing done. Every week, my team and I generate three hours of live video training, two newsletters, six written tutorials all to feed YouTube, iTunes and my two websites: larryjordan.com and digitalproductionbuzz.com. I also write for three monthly magazines and travel the country doing speeches and training. So each day starts with me asking myself: “What deadlines do I have today.” Then, like this interview, I need to buckle down and meet them. AV3: Do you have any big upcoming projects you’re working on? Care to share some details with us? Larry: Our weekly podcast - DigitalProductionBuzz.com - is undergoing a major facelift for the website and reformatting for the video webcast. We are modernizing all the graphics and music, improving the guest list and making the interviews much more relevant. This is a one-hour live broadcast - which takes me back to my roots - every Thursday at 6 PM LA time. You can watch it after the fact on YouTube or iTunes. I’m very proud of what we are doing here - providing state-of the-art news and information on the media industry every week. We'd like to thank Larry for taking the time to chat with us and for sharing these fantastic insights. We recommend that every reader checks out the DigitalProductionBuzz show!